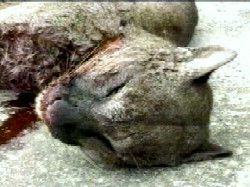 61-year-old Dave Parker stabbed this cougar to death with his pocketknife after it jumped him on a Port Alice trail. The knife Dave Parker used to kill the cougar. A 61-year-old man won a life-and-death struggle with a cougar outside a small northern Vancouver Island village, killing the animal with his 7.5-centimetre pocket knife. Dave Parker was jumped from behind while walking on an industrial road two kilometres south of Port Alice, a village of 1,300 about 370 kilometres north of Victoria. The retired pulp-mill worker was attacked Thursday evening by a 45-kilogram adult male cat, conservation officer Ken Fujino said. Parker was being mauled but managed to get to his folding pocket knife. Despite extensive wounds, Parker managed to walk about a kilometre to a forest mill's log-sorting area. 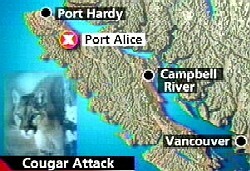 Late-shift workers rushed him to Port Alice's tiny hospital.
" Because of the seriousness of his injuries they took him by ambulance to Port Hardy and flew him down to the hospital (in Victoria)," said Fujino. He underwent surgery Friday to repair his wounds and was recovering in the intensive-care unit. "He's out of surgery and in stable condition," Lianne Peterson, a spokeswoman for Royal Jubilee Hospital in Victoria, said Friday afternoon. "I don't know much about the surgery other than plastic surgeons were involved." RCMP Const. Jeff Flindall said police found Parker's knife next to the carcass of the dead cougar. 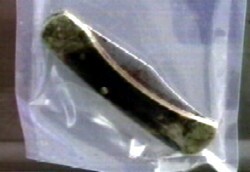 "It is a pocket knife and it is approximately three inches long," Flindall said from Port Alice. A Seattle tourist was cycling outside Port Alice when he was jumped by an injured cougar. A passing motorist saw the man struggling with the cat and waded in to chase it away. The animal was later tracked and killed by conservation officers.